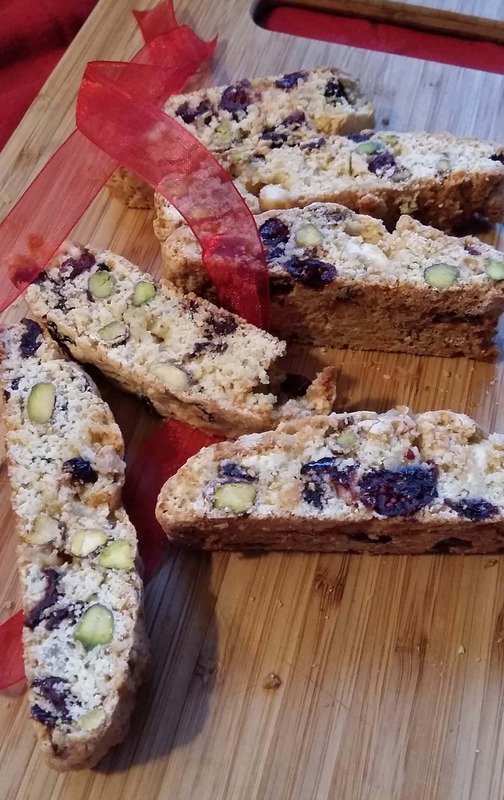 This delicious pistachio, cranberry and white chocolate biscotti is packed full of Christmas flavour! I can’t believe it’s only one month until Christmas. I don’t think I’ve ever been so unorganised. I have bought and tucked away a few small gifts but that’s about it. At least I have plenty of wrapping paper – my local supermarket were selling it off for 2p a roll back in January! I can never resist a bargain. In the meantime, I’m officially declaring it the run up to the festive season over here. Foodie wise, at least. I can’t help but get completely caught up it in all – bring on the gingerbread lattes, clementines, those beautiful boxes of jewel like shiny fruit and nuts, panettone, marzipan filled stollen, and gingerbread reindeers. This cranberry studded, orange scented biscotti would make a gorgeous gift, wrapped up in Christmassy cellophane. The lucky recipients favourite coffee or hot chocolate to enjoy with the biscotti would be perfect. Let the festive baking begin! Place the flour, sugar, orange zest, cranberries, pistachios and white chocolate chunks in a large bowl. Beat the egg, milk and orange blossom water (if using) together and pour over the dry ingredients. Mix together until you have a soft dough (I use my stand mixer but I've done this with my hands.) When the dough has come together, cut it in half. Line two baking trays with parchment. Place it on your work surface and tip one half of the dough out on top of the paper. Pat it out into a log shape, about 25cm long. Flatten to about 3cm thick. Repeat with the other half of the dough. Bake the logs for 20-25 minutes or until lightly browned. Remove from the oven and transfer to a cutter board. Turn down the oven to 150C. Using a serrated knife, carefully cut into 2-3cm slices. Return to the baking tray, cut side up and bake for 10-15 minutes. Makes about 25 little biscotti. Ugh I feel you. I haven’t bought any presents, have no idea what I’m getting my nan and have not even thought about what we’re eating on the day ?! I’m not sure why I haven’t baked Biscotti before. I think the super hard, crack your teeth, shop bought variety is to blame. I am definitely going to try now though. Homemade anything is always better, right? Thank you for the fab recipe and inspiration. Sammie. That biscotti! Do you think walnuts would go well with it instead of pecans? That would work just fine Melisa ?